yes, this latest update Im finally happy with stoping 1.10 and moving on. I didnt' want to leave an unfinished version in 1.10. That's clucking awesome mate, well done! I wish you could analyse chickens in the egg nest and nesting pen. I don't even know how many times i had to take out chickens just to analyse them and compare. I've tried to pull data off the chickens, for some reason I haven't been able to make it sync to clients. Technically the code is live, but it has never worked. Is there any chance that this mod will be made to be compatible with all versions of the Chickens mod? 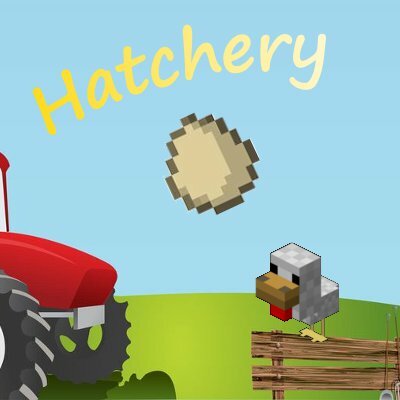 I'm running 1.8.9 because of compatibility with all the other mods I'm using, and would really love to be able to use Hatchery as well with it! Backwards compatibility probably wont happen. I have to rewrite some code that got a little crazy to go up versions. Hello folks, I have a quick question that I haven't been able to find an answer for elsewhere on the interwebz. I am playing Skyfactory 3 modpack from the FTB launcher and it is my first time using the Hatchery mod as well as a number of other mods in the pack. I am at the point where I am looking to gain a rooster to boost my chicken production for the Chickens mod. However, I am having some trouble acquiring said rooster. Do they spawn naturally? If so perhaps my spawning luck is just that bad. If not I am looking for tips as to how to come across one. Thanks in advance for the help. Thanks for the reply! I just seem to be having some extraordinarily bad RNG luck. Welp, back to the grind. being its sky factory, it could be the biome your in. Since my question is along the same lines... I'm in Sky Factory 3 trying to get a rooster to spawn, is there a specific biome needed for it? I'm currently in a forest biome, but Have yet to see a rooster. my SF3 animal farm is in a ForrestHills biome, and i had a rooster spawn relatively quickly after creating the area. there must have been at least two because he was almost dead when i found him, and there was a piece of raw chicken on the ground. Trust me I want to, I have been super busy last couple weeks. Hello.. I'm having a small issue with the nesting pens and using the animal net to place chickens inside the pens. I've seen countless instructions saying i need to simply right click with the animal net on the pen and it should place the chicken there but when i do this it just opens the nesting pen inventory and refuses to place the chicken that is inside my animal net.. I feel like theres a simple solution and im probably just not seeing it? any suggestions? incredible. I'm forever in your debt.